The Orbera® balloon has been in use by The BMI Clinic (formerly Gastric Balloon Australia) since it was established. We have inserted more Orbera® balloons than any other clinic in Australia. The Orbera® Intragastric Balloon is a soft, silicone balloon which is inserted into your stomach through your mouth via a scope (camera) before being inflated with sterile salt water. 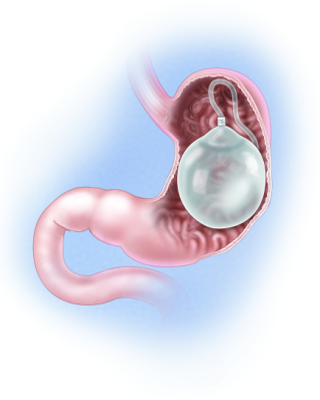 The Orbera® balloon can stay in your stomach for up to 6 months, before it is deflated and removed. At The BMI Clinic, we combine the Orbera® balloon with our Silver, Gold or Platinum lifestyle program, to provide you with essential support and professional advice to sustain the habits the balloon assists you to create. How does the Orbera® work? The balloon insertion is a 20-minute procedure done in a day hospital. You will be sedated (put to sleep) and the deflated balloon will be placed into your stomach via an endoscope (camera on a thin tube) through your mouth. It will then be inflated through a port on the balloon. You can expect to be at the hospital for 4-5 hours including paperwork, procedure and recovery. After 6 months, the Orbera® balloon is removed through the mouth in a similar way as it was placed. The Orbera® balloon is a tool to aid weight loss, giving you a kick-start by allowing you to control portions as you develop healthy and sustainable habits – habits that will last well beyond the 12-month balloon placement. We know the balloon is most effective when accompanied by a lifestyle program, which is why at The BMI Clinic, the Orbera® balloon is paired with either our Silver, Gold or Platinum lifestyle program, delivered by a team of weight loss specialists, including Bariatric Physicians, Nurses, Dietitians, Exercise Physiologists and Behavioural Coaches. Data from our own clinic demonstrates the more a patient engages with the team, the greater their weight loss. How much weight can I expect to lose with the Orbera® balloon? The more you engage with your team, the more successful your weight loss journey will be. You can expect to achieve 11-13% TBWL (Total Body Weight Loss; ie. a 100kg person could expect to lose 11-13kg on average), however ultimately, the amount of weight you lose and maintain will depend on how closely you follow the advice of your medical and allied health care team.